Our clients have a lot to say about their experiences with Bliss Travels. And they say it better than we can. Take a look. Lunch on the back porch of the home of a great chef! A glass of Burgundy and snack before returning to Paris! Gourmet lunch in a place opened just for us! Boat ride through the cliffs, swimming too! From K.D. Ca. Sept 2016: "Thank you for arranging and hosting a trip of unforgettable memories. You...outdid our wildest dreams of chateaus, hotels, food, wine, events, sights, trips and commeraderie. We loved being treated so specially in all ways. You took our breath away again and again"
From B.F. OH, June 2013, and April 2015: "You more than exceeded my expectation on this trip and I think I can safely say the same for the entire group....The food, wine, rooms and activities were one of a kind. Provence was exceptional, but this was mind blowing. You offered so many incredible experiences! Thank you again...for another off-the-chart travel experience." From D.P. Mich, Sept. 2015 Bordeaux, Basque France & Spain: "I truly loved each and every day of this trip. Thank you for the opportunity to experience the food, wine and beauty...of France and Spain." From G.H. Fla. April 2016 Burgundy, Paris, Provence: "You planned an awesome trip for us. Thank you for all of your hard work and great spirit that you put into making it a great trip. We look forward to our next adventure." From N.W. California, April 2016 Burgundy, Paris, Provence: "We both of us had a great time...Travelling companions were fun - and all your planning was perfect. Enjoyed the lovely hotels and gourmet dinners were tasty andfun. You paced the timing i.e. planned activity with free time just right...would recommend your trips in a heartbeat." From A.R. California, April 2016 Burgundy, Paris Provence: "As usual we had a wonderful time on the trip! We especially loved the vineyard tours in Beaune, and going into the caves and speaking to the winemakers felt extra special. The wine lessons and educational tastings were much appreciated too.... One thing I appreciated was the ability to customize our tour, and I’m glad we were able to do that... and it’s nice to be able to be more spontaneous. I really liked your choice of hotels too.... So charming and comfortable.Anyway, Jeff and I really appreciate the efforts you put into making your tours very special holidays for your clients. Hopefully we will see you again in the future!" From R.F. GA, April 2016, Burgundy, Paris, Provence 2016 (return traveler): "Thanks for the wonderful trip...We had a great time." From R.M. Calif, Oct/Nov 2015 Provence, Burgundy & Paris: "I just wanted to...say everything so far has been amazing...Some of the best food and wine I've had. I am officially a Burgundy fan! Thank you again for planning such an unforgettable vacation." From J.R. Mich. Sept. 2015, Bordeaux, Basque France & Spain: What a great trip! I would definitely recommend Bliss Travels to friends...It was great to get your knowledge on French wines...in such an intimate atmosphere...All of the food and wines were awesome." From S.C. Okl. August, 2015 Paris, Barcelona & Provence: We both want you to know how wonderful our trip was and how much we enjoyed YOU, our guides, new friends and the amazing [places]...Since we had not travelled with you before and we did not know what to expect, and we were so happy with everything you arranged and provided....You gave us a joyous birthday adventure." From E.B Wash. DC, August 2015 wedding Paris: "We had an amazing time! Each event was more than we could have imagined; everything went off without any complications and all of our guests went out of their way, multiple times saying how great everything was. SO, a big thank you to you for all your help." From A.A. OH, April 2015: "[We] both had a fabulous time on our trip. The worst part was coming back to work and reality....We enjoyed the trip so much we would like to take another one with you.....need I say more?!!!" From J.D. Fla. April 2015 "You are the best! What a great trip.... Thank you so much for your generosity every time we did anything. I will definitely do another trip with you..."
From P. N. OH, March 2015: "[A]bsolutely wonderful and I'm so thankful for a truly special and memorable experience!! We're still swooning over the culinary experience and your wine pairings were...superb!!!! What impressed me most was your enthusiasm and obvious love for what you do. I loved every second..."
From C.B. Wash. DC, 2011, 2013, 2014: I recommend Bliss Travels to all my friends and colleagues. Wendy provided us with the best travel experiences we have ever had. We just tell her what we want and put ourselves in her hands, and don't even think about anything again. These have been the most stress-free planned trips, and some of the most memorable, we have ever been on. If fact, although my wife and I never had a desire to visit Paris or France, after taking a chance and booking the Valentine's Paris trip through Bliss Travels we've returned to France twice more, simply because of Wendy and Bliss Travels. The personal attention you receive is unmatched anywhere. Wendy and Bliss Travels receive my highest recommendation..."
From S.H. Fla. October 2014: "The trip was truly exceptional and a great way to celebrate our 25th.... The memories we have of this trip will be with us always. You did a fantastic job... We could not have had as wonderful & easy a trip if we had done this on our own. The fact that some time was planned, and some time was free was just what we were looking for! And the opportunity to meet like-minded travelers added to the experience. If only all vacations were as smooth as this. Sadly, we have to return to normal routines; however, now we'll do it with French flair." From M.P. N.J. Oct 2014: "The food was delicious, the wines were wonderful and the company awesome. Thank you for a fantastic experience." From A.R. L.A. Ca. Oct. 2014: "[We] had a wonderful time! You were the perfect guide, and Emmy was the perfect hostess! The food, the wine, the village, the inn...all marvelous, couldn't have been better, and we truly couldn't have experienced any of it on our own. Also, I really enjoyed having individual time to rest or to explore on our own combined with the group activities. It was an ideal mix." From B.P. South Carolina, Oct 2014 " We enjoyed our trip very much and we think both of you did a remarkable job with our wedding details and the trip activities. We have made some friends during our trip that we have been staying in touch and are truly thankful. We would recommend your services to other[s]." From J.M. Canada, Oct 2014: "We had a wonderful time with the group. All wonderful people and lots of fun." 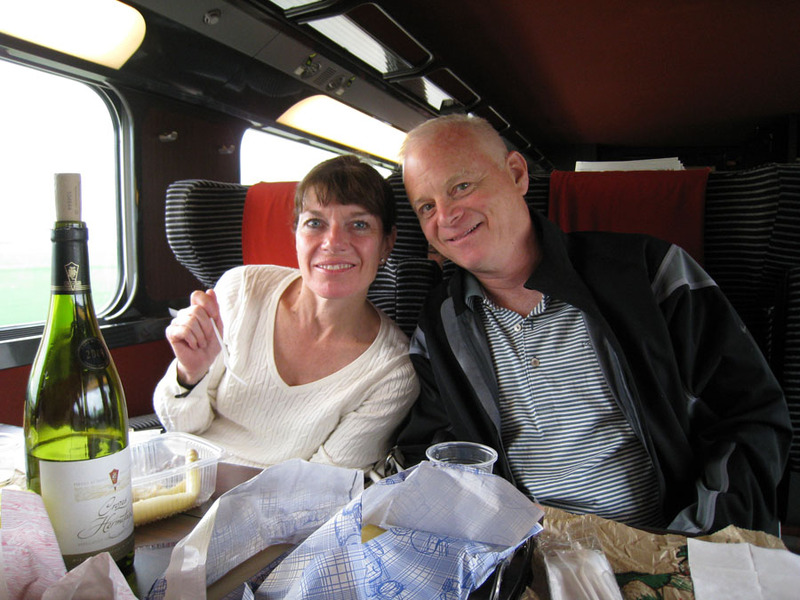 From W.C L.A. Calif, Sept 2014 "[We] really had a wonderful time in Bourgogne." From B.H. Wash. DC, Provence, June 2014: "We are still floating about on memories of a fabulous trip." From C.W. June, 2014 Wash. D.C. , Provence, June 2014: "Loved, loved our trip. Missing France and every wonderful thing you taught us. [We] are ready for another trip." From K.L. (Provence, May, 2014 NYC) "I had such a wonderful time in Provence - thank you so much for a fantastic experience!....The combination of the physical activity and culinary experiences were just perfect! From A.T. (Atlanta, Provence, Oct. 2013) "We had a blast on our trip and are still remarking on the joie de vivre exhibited by one and all! Great group of folks, great times and great food! Thanks again...for the splendid memories!" From L.S. Atlanta & Sweden, Provence, Oct. 2013 "I wanted to thank you again for a fabulous experience in Provence! We loved the trip, loved our fellow travelers, loved our guides, loved the food, loved the wine! What more could you ask for? It was a wonderful 30th anniversary. Looking forward to hearing about more trips to come." From T.T. (Atlanta, Burgundy, September 2013) "I did want to tell you that I was worried that our second trip would not be as good as the first but WOW it was truly something special. I have never tasted such good wine! And your ability to get us into places no one else gets to was outstanding. I appreciate your personal attention to detail and your ability to make it feel like we are traveling with friends-which we are now." From A.M bride (April 2013 Paris wedding) "Thank you for an amazing time!" (from groom) "Thank you. You did a wonderful job. We really had a special time and look forward to going back. " From V.P. (Fla. Paris, April 2013)"The entire trip was fabulous. I cannot believe how great the food was. The whole trip was outstanding !!!!" From J.B (Miami, Burgundy, September, 2013) "Thanks again for planning such a great vacation for Jeff and I. We had a fabulous time and getting engaged on the trip was just the icing on the all ready delicious cake. We are still wondering how we will be able to go back to drinking the wines we liked before after tasting so many fabulous ones on the trip." From M.B. (GA. Paris, Provence & Mediterranean, August 2013): "How can we thank you enough for assisting us to step into a "dream come true" experience. Every aspect of our time in France was a "more than we could ask or think" adventure. Your recommendations, planned activities, and personality were amazing. Thank you for giving so much to all of us to immerse our every moment in France in "bliss". From B.A. (Fla. Provence, May, 2013) "Thank you for leading us on a magical journey throughout Provence! Your warm hospitality, thoughtfulness and knowledge of the area made our experience very memorable. We would highly recommend Bliss Travels to anyone who loves food, wine and culture at its finest. " From J.B. (N.Y. Provence, June 2013) “Thanks for a wonderful trip thru Provence….We truly loved EVERYTHING!....We are still romanticizing sitting on the bench at sunset, overlooking the beautiful valley….The food (unforgettable meals), the wines (rose's & your wine tasting), the art (Esther, Marjolene, & the various galleries), the people..., ALL the various places we would never have found on our own, AND YOU and Anthony! Thank-you, thank-you, thank-you....we now have wonderful memories." From C.B. (Wash. DC, Paris, June 2013) "Thanks for a fabulous itinerary. [The] walking tour was splendid. Thanks again for all you did for us. This is a very memorable trip." From R.M. 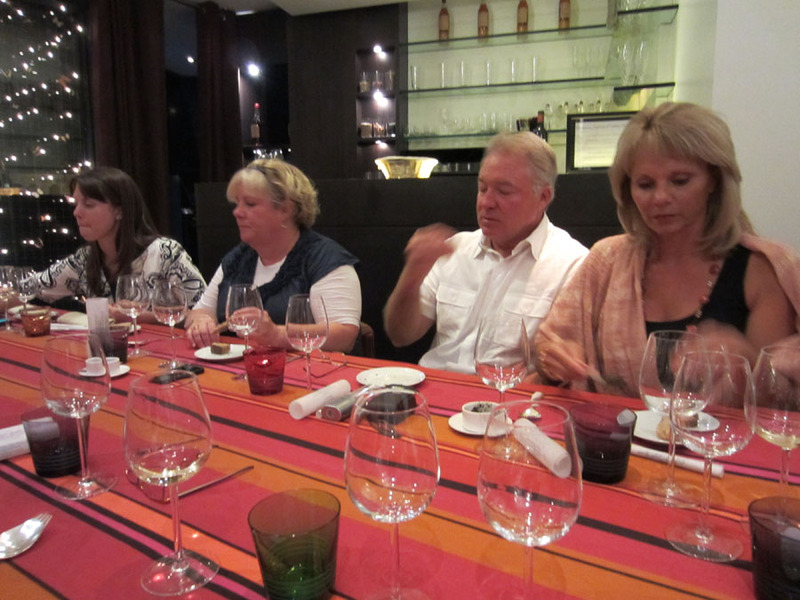 (N.C., Paris, Nov. 2012) "Fabulous trip...rooms and food just tops….perfect...in every way. Thanks for all your help." From E.S (NYC Provence, Mediterranean, July, 2013) "Thank you for a spectacular trip to Provence. Gary and I enjoyed the entire vacation immensely as it was exactly what we hoped it would be and more. I enjoyed the 3 locations that we stayed at and thought each place gave a slightly different perspective into the french lifestyle and culture. Sumner [our assistant] was adorable, helpful and a great source of information. We loved traveling with you, it was great to have outings planned for us. Everything we experienced was truly wonderful.... Thank you for our gifts, that was very thoughtful. I LOVED [the Mediterranean] it made me want to drop everything and stay a while." From M.M (Houston TX, Provence & Mediterranean, July 2013) "Thank you for this beautiful video! We had such a great trip and thoroughly enjoyed everyone! We look forward to returning to France as soon as possible [for a 3rd trip with Bliss], and we hope to see everyone again soon!" From C.S. (L.A. Paris & Mediterranean, July, 2012) "So sad to be leaving France. Thank you so much for putting this trip together. It was Everything I envisioned my first trip to Europe was to be. Next year......running with the bulls!!" From S.W. (Conn. Provence, August, 2013)"Thank you for creating such a wonderful trip. You clearly have a special talent!...No doubt we will cross paths again!" From L.J. ( L.A. Paris & Provence, August, 2013) "We had a great time and enjoyed meeting you so much. The fellow travelers were a fun bunch! We would love to do it again sometime in the future....We keep telling friends that the trip with Bliss was great." From R.A (Fla. Oct, Provence, 2012) " I had a great time....You have given me the opportunity to experience sights, sounds, smells, food, laughter, friends, wine and places I never would have experienced on my own....I would recommend this trip to anyone." From J.C. (N.Carolina, Paris & Burgundy, Sept. 2012) "Our time in Burgundy was so special.... [We] want to thank you for all your hard work in putting together such a fine tour. We know it takes time to develop the relationships you have in France and we also know how much it added to making our experience so unique. We will be talking to our friends about doing another trip with you and Bliss Travels. Please stay in touch with any special tours you might be doing. Thanks so much, Wendy, for such a delightful experience." From C.H. (Conn. Provence, May 2012) "Thank you..., for an absolutely memorable vacation adventure. Your planning and attention to detail was absolutely superb. I felt immersed in the culture and lore of the land as you ferreted out exceptional sites for us to explore such as the Borie village and hidden little restaurants;the cuisine was luscious and interesting. The candlelight dinner in the 400year old hideaway will remain indelible upon my memory, felt as if I was in another era. Will savor the memories…. Because of your passion for Provence and connections, we were privileged to really enjoy off the beaten path exceptional experiences….I really appreciated your attention to detail and sincere concern for the well being of each of us…. Particularly impressive was your resiliency and ability to change direction when indicated for any situation that arose." From W.R. (N.J. Provence, June 2012) " I had a super time and the whole adventure was a wonderful experience. From the tours, site seeings and all the delicious food. I would always have great memories of my vacation in France. You made it all happen for me. Thank you very much for everything." From B.B. (Stamford - CT - Paris, June 2012) "We really had a great trip, you made it all come together so nicely, picked a perfect hotel and a fantastic mix of restaurants. You made all of the planning so easy and stress free. The tours of the sites, gardens and museums was perfect ... we feel that we really got to "know" Paris in just a few days. .. we look forward to planning a return trip with you just as soon as we can! " FROM P.C. (L.A - Holidays in Paris, Dec 2011) "Thank you so much for this ...trip of a lifetime! Your graciousness and kindness to both my sister and to me have given us a lifetime treasure of incredible memories of a city that we will hold dear to our hearts. I'm already dreaming of Provence!! I'll be in touch with you soon re: future trips. " From D.T. (Washington D.C. Burgundy, Sept. 2011) "I had the most wonderful trip to Burgundy with you and Bliss Travels last September. As a former head of the Bordeaux wine society in Washington, DC, but a great lover of Burgundies, I can tell you that all of my expectations were exceeded, from the pre-Burgundy days in Paris , during which I experienced things I had not, despite living in Paris for almost 5 years, to the Burgundy Adventure - including where we stayed, the tours, both of Beaune and the chateaux, the teaching sessions, and the meals (Ah, the meals!) it was the best vacation of its type I had ever taken. " From M.M. (Houston - Texas Paris, December, 2011) "I cannot begin to express how grateful I am to you for arranging such a wonderful trip! I'm back at work now and haven't stopped talking about it all morning! I think you'll be getting a lot of business from Houston once I'm done. We truly had an amazing time and look forward to traveling with you again! (Hopefully soon!!!!!) 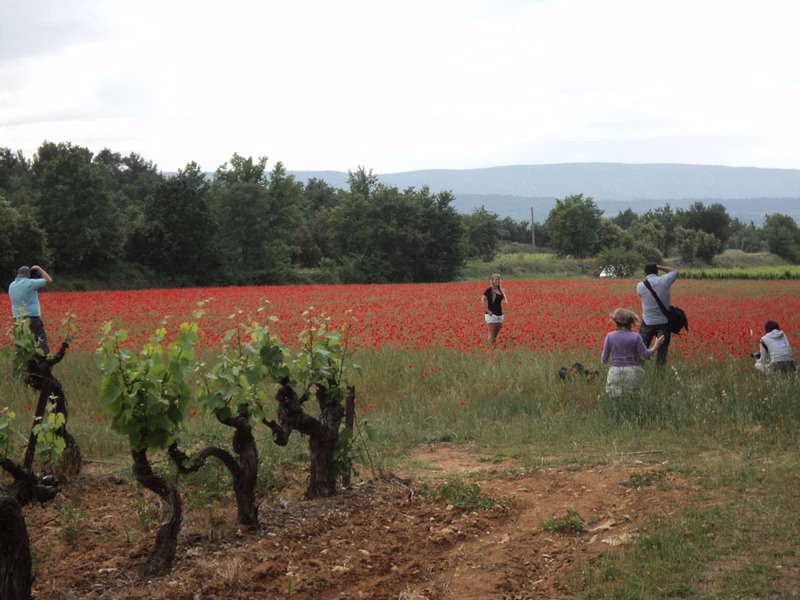 "
From F.H (Oklahoma - Provence, August, 2011) "There was a group traveling to Provence. When they met and they clicked, quel Bon Chance! With their tour guide named Wendy. They ate and drank vin, OUI! Oh what BLISS they encountered in France! " From T.F (Miami Provence, August 2011) "Thank you both for such a wonderful trip! We definitely did not want to come home (I am still trying to figure out why we did). You are such a great team and the tour was over the top! [We] just wanted to send a Big Thank You for everything!" From K.L (Montclair - New Jersey - Paris, Provence, Med, Burgundy -4 trips 2011) "Exploring your dreams and passions, that is what I have been able to do this year with Bliss Travels….Wendy’s contagious enthusiasm for her work got me to take my first trip with her to Provence in May 2011 . SInce then, I have gone back two more times to explore the wine harvest in Burgundy and Christmastime in Paris. I have experienced things that you could only do with someone who has an intimate knowledge of the country, language, social customs, personal friendships and more. A dream come true for me. Each time, I learn more and get excited to return to discover more. If you are looking for an exceptional travel experience, call Wendy and create your personalized French adventure. It will be a trip to remember and always bring a smile to your face." From T.T, (Washington DC, Provence, July 2011) "Everything was fantastic…Great accommodations, attentive...a fabulous time.The opportunities to laugh and relax [are] plentiful." From S.C (Telluride - Colorado Provence August 2011) "Truly a memory maker….Thank you." Anonymous, August 2011 "A must! Top notch food and very personalized. The best way to get immersed in the culture." Anonymous, August 2011 "See the best of the best. All the secret places…Do it!" From D.T. (Washington D.C. September 2011) "I cannot tell you how much I was impressed with you, what you do, how you do it…. What are you planning for Christmas in Paris?" From P.P. (Vermont, Burgundy, September 2011) "What a great trip! i loved everything and [my son] is still in "bliss". Thanks." From K.L (N.J. Burgundy, September 2011) "The trip was just amazing. Thanks so much for all the hard work that you do!!" From D.S (California, Provence, October 2011) "I just wanted to let you know that you two went over & beyond my expectations. I also thought that our group was great & we all had a fun time together! It was perfect for what I was looking for!" From J.S, Provence, October 2011 (New York) "Thank YOU both for making this wonderful trip memorable. It's hard for me to pick out a few things that I loved the most...From the train experiences with food & wine to the welcoming dinners.... and all the breath taking views in Provence; what's not to love! .... I also loved the photography tips. While I'll admit I was a bit intimidated at first ....I'm an amateur who likes to take photos (like most people)... now at least I can pretend to know what I'm doing....Your enthusiasm and attention to detail together with the terrific group of people has made this trip a warm experience for me. I will most definitely recommend Bliss Travels to others. I might actually do another trip myself…..Thank you for making this trip so terrific!" From L.C, (N.J. October 2011) "We did have a great time and I honestly don't have anything negative to say at all. We were very happy. I would be happy to be a reference for your trips…." From B.L (Cleveland, 2010) "I had less than 3 months to plan my wedding but…things went smoothly and were well organized. I had excellent communication with Wendy about all the small details which really helped with my wedding jitters. She also did a wonderful job of helping me iron out the kinks of things I hadn’t even thought of.…By the time we got there everything was in place. I really didn’t have much to do (she) took care of everything. All I had to do was enjoy Paris….The experience was irreplaceable. I enjoyed not worrying about anything. I’m pretty Type A and on my wedding day I just relaxed….My father said it was one of the classiest events he had been to….I definitely recommend Bliss. They put their clients interests first. BLISS KNOWS FRANCE!" FROM B.T (Princeton) "This will change the way I travel forever." FROM J.F (California) "On previous European vacations… I utilized the services of a tour group. Getting crammed onto a bus and shuttled from place to place with different guides with varying degrees of English comprehension does get frustrating. However, there is hope in the guided tour industry and her name is Wendy Jaeger. My wife and I utilized Wendy’s services for our honeymoon to the south of France and our experience can only be described as remarkable. The personalized itinerary, the culinary smorgasbord, and most importantly, connecting with French culture in such an intimate way. With Wendy as your guide, you tour some of the most breathtaking sites in the region without the regimented style of a tour group. Her familiarity with your location also holds another benefit, meeting the locals. It was great being able to converse with the people because it creates a bond with these places you cannot get with a tour group. Without a doubt this is how I will be vacationing in the future." FROM A.O (Princeton) "[What was special about the trip was] your connections with everyone there and the fact that we were able to experience restaurants, lodging and other activities that would not be available to us ….thanks again for a wonderful trip. [We] had an unforgettable time. " FROM C. S (Princeton) "I can’t thank you enough for all you did to create this amazing trip for us. It was the perfect combination of beach, city and countryside…..I will spread the word of Bliss Travels to everyone!" FROM S. H (11 years old) "Thank you so much for arranging our wonderful trip to France. I had so much fun and learned about so many amazing things. This was a very special vacation and it was my first time out of the country. Surprisingly, even though I thought [Provence] was going to be my least favorite place, it turned out to be my absolute favorite. Although I might have enjoyed Paris the most if you had been there to help us find all the right places to visit and all the right things to do…..Going on the trip inspired me to learn the French language….I really want to go back next year and hopefully be able to speak a little bit of the language." FROM J.D. "My time in the south of France was great, but nothing made me feel more connected to the people and the food than when I was allowed to look upon a French kitchen in action….Also the advice and guidance I was given by these two chefs and the restaurant’s owner will always be held close to me when I go off into the culinary world…..This experience in the kitchen of a real French restaurant will always be close to me as one of the most enlightening moments of my culinary career and if I was ever given the chance to go back to France and watch the action of this kitchen again I would take it in a heartbeat." FROM L.H and R.P. (2007) "Bliss Travels…. provided customized itineraries and travel services for us when we went to Paris, France, which was a combination of business and pleasure….We wanted to make the most of our free time. [Wendy] provided us with outstanding recommendations for meals that were tailored to our preferences….. [She] was familiar with the menus and the chef’s culinary style for each of the recommended restaurants in Paris. In addition, she made the reservations for us (in French), which was helpful, as we do not speak French, as well as providing a personal connection with some of the chef’s…[S}he provided customized maps designing pedestrian tours (our preference) in the various areas of Paris that could be enjoyed during our limited time. She arranged for museum passes so we could optimize our sight seeing time and not wait in lines with all the other tourists….she even calculated and mapped personalized 6-10 mile runs for us from our hotel…. I highly recommend the travel services. Wendy is an intelligent, energetic, and highly organized travel source with services that are tailored to the needs of her clients. When you combine her 30 year record of traveling to this region, with her culinary expertise, Bliss Travels provides a meaningful travel experience for all types of clients interested in European holidays. " FROM M.M (Princeton)"….Wendy proved to be an extraordinary leader…. Her in depth knowledge of local talents, culture, heritage, and regional foods afforded unique opportunities…. 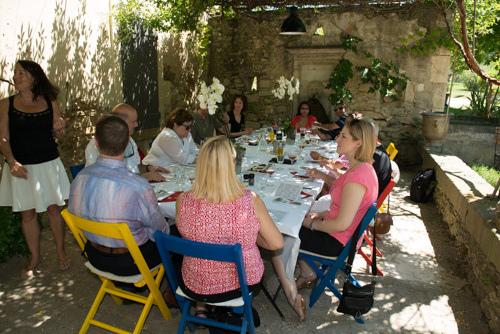 It is apparent that the relationships that Wendy has with the many providers in the Luberon region, the result of rekindling and revisiting over decades, are an uncommon resource. The depth of her knowledge and familiarity with the customs and culture, coupled with thoughtful planning was integral to the success of this adventure." FROM B.M (Pennington) "As you know, there were three generations of girls from my family who got to experience this wonderful tour of Provence: my 78 year old mother, my 12 year old daughter, and myself (I’m not telling). Everything was perfect, from the unbelievably delicious and fresh food and the plentiful wine to the beautiful countryside and charming hotels. All of us had the time of our lives and would love to experience another trip with Bliss Travels to any other part of France that you go."